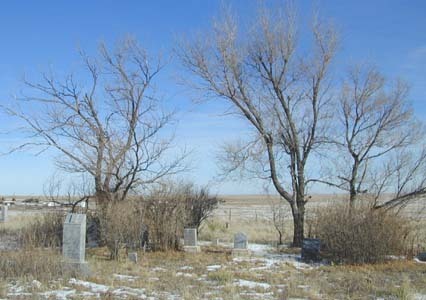 Myers Cemetery is located south of Calhan, approximately 35 miles northeast of Colorado Springs on U.S. Highway 24. It can be reached from Highway 24 by turning south on Calhan Highway and proceeding east on Funk Road and south on McQueen Road approximately mile. A sign for the cemetery is on the west side of the road, and the cemetery is located about five hundred yards northwest of the sign. An easement to the cemetery has been fenced off and can be driven. According to GPS-derived geolocation (accurate to within 10 meters), the cemetery's coordinates are 38°59'20.9"N and 104°15'43.0"W.
Although the town doesn't own the cemetery property, as a courtesy the city clerk at the Calhan Town Hall maintains the sexton records that were provided to the town. While the cemetery has more than 50 grave sites, only about half of them have markers with names. 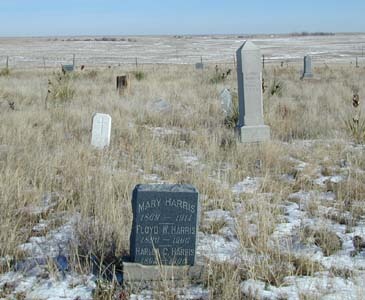 The cemetery is located on private property on a hill in a farmer's fenced pasture. The view from the cemetery is that of farmland dotted with a few farmhouses. According to Mrs. Hattie J. Tibbs, the cemetery was established by her great-grandparents, Don and Mary Jane Myers, as a family cemetery, but with the understanding that is would never be sold and would be used as a community cemetery. The Myerses homesteaded southeast of Calhan and settled on two sections of land. According to Mrs. Tibbs, they are both buried here without markers. A 1971 extraction was published in the Colorado Genealogist, volume 33, page 101.